Pink disease is a disease that affects the stems and branches. It is primarily a disease of the bark, in advanced stages the infection spreads from the bark into the underlying wood. Symptoms The characteristic symptom of pink disease is the appearance of a salmon pink incrustation produced by the growth of the fungus found on the surface of the bark. 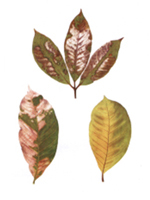 The subsidiary symptoms of Pink Disease are; Wilting and subsequent death of the leaves, which turn brown and remain attached to the infected branch for some time. Bleeding of the branches or stem, forming black streaks of coagulated latex. Green lateral shoots arising dormant buds. Open wounds or cankers resulting from the death and shedding of limited areas of bark. Red root disease is common ailment to a rubber tree. As the disease is slow growing it may not be noticed until the tree is ready for tapping latex. Symptoms The symptoms must be sought by examining the root system of the tree. The fructifications are hard woody brackets with a dark red brown wrinkled upper surface, smooth gray white under surface, and a swollen creamy white margin. 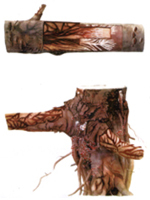 Infected roots are covered with a red skin of mycelium to which soil adheres, but the red color may not be apparent in a fresh specimen until it is washed. 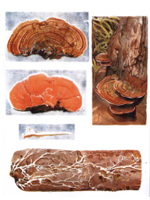 The growing margin of the fungus is creamy white; the characteristic red color is formed some inches behind the limit of advance. In the early stages the rot is pale brown and hard. In the later stages it is pale buff, wet and spongy unless the soil is dry. It is unlikely, the rot produced by the other two parasites affect the annular layers of wood. White root disease is the most serious of all diseases found in Malaya. Not only does it damage the tree, but it involves heavy expenditure for its control. Symptoms When symptoms begin to appear in the aerial parts it is too late to save the tree. Likewise fructifications of the fungus forms much too late in the history of an attack. Therefore it is late in diagnosing and then curing the disease. 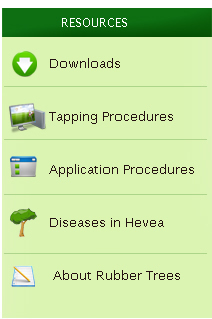 One must rely on symptoms appearing on the roots themselves in order to recognize the disease. The symptoms on the tree as a whole are exactly those to be expected if the roots were to be progressively cut away. The leaves go yellow and die. Frequently a diseased tree blows over before the foliage has been visibly affected. 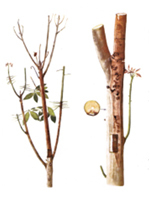 Fructifications may be found, especially during wet weather, at the collars of infected trees and on large exposed roots or stumps that are in advanced decay. The brackets are firm, fleshy, and usually tiered. The rhizomorphs are white flattened strands, usually sparsely branched. Old rhizomorphs become rounded and pale orange red. The wood of a root which is newly killed is brown and hard; in the later stages it is white or cream and usually firm. This disease is not very common but has striking symptoms that are easily recognized. Symptoms The Characteristic smell is not a symptom of the disease as it is produced not by the usual parasite, but by fungi and bacteria which grow in association with it. The smell may be sufficiently strong to be discernible to persons walking through affected fields. The characteristic rhizomorphs by means of which the disease can be recognised do not appear on the outside surface of an infected root. 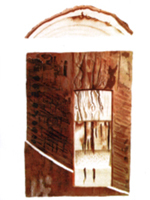 When the bark is stripped off the pattern is seen: dark brown flat strands on the surface of the wood, and a white impression on the inner surface of the dark. The dead wood has no characteristic rot. 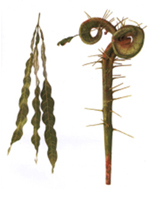 The tree dies after showing the foliage symptoms displayed after attack by any root disease. This disease is probably more common and responsible for more damage than is generally recognized. Symptoms The superficial symptoms may be confused with mould rot or tapping wounds. Careful examination shows small areas of sunken discoloured bark just above the tapping cut. On scraping away the bark, vertical black lines are seen to underlie these areas and to extend a short distance below the tapping cut.The black lines are wood vessels that a pathogen has invaded. Growing under the renewing tapping panel, producing splits and cankers in the overlying bark. Splitting and latex exudation from the older renewed bark may be unassociated with streaks on the surface of the recently tapped bark. Some clones are more susceptible to infection than others; in Malaya PB 86 is found to be particularly susceptible. Dieback is a progressive death of the branches starting at the extremities and extending towards the main stem until the whole tree may die. The dieback described here is different from branch death due to poor nutrition, disease, or any injury affecting the tree as a whole, and from parasitic invasion of the branches. Symptoms Dieback is indicated by dead leafless branches in the upper part of the canopy. These should be distinguished from living branches that have merely lost their leaves. In cases only a few months old the young shoots that have died remain as shriveled, curved brown twigs. 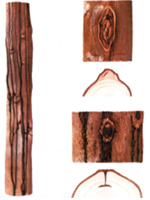 There is a well defined boundary between dead wood and living wood of an affected branch; this may be discerned from a changed appearance of the bark but is more obvious when the branch is cut into. On larger branches the boundary often extends much further down one side than the other, giving the characteristic spearhead effect. Vigorous shoots may grow from one side while the opposite side is completely dead. 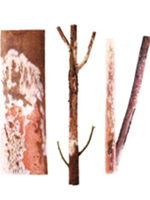 Short vertical splits in the bark from which latex exudes are not uncommonly seen on young high yielding trees, but they lead to no other effects. Sometimes there is internal bleeding and a pad of coagulum forms against the wood; the overlying bark then dies. Callus growth surrounding the wound may heal right over it, but often renewed bursting occurs at the same place, giving rise to a large burr comprising successive layers of rubber, wood and bark tissues. Bursts and burrs may occur anywhere on the stem and branches. With the post-war development of chemical weed control on rubber estates there has been a great increase in the number of cases of accidental poisoning. So long as only the leaves are affected little damage is likely to happen, but it is important to know the effects so that stem damage can be recognized. Direct contact with a herbicidal spray leads to large patches of whitened dead tissue which are rapidly invaded by saprophytes. 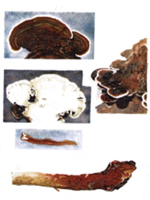 Absorption of poison on a scale insufficient to kill the tree produces a pattern of dead bleached tissue, which eventually becomes invaded by saprophytes. Malformation is normally encountered in the most actively growing parts – the leaves and young shoots – of young plants. It may take various forms and have several causes. Symptoms The plant is distorted from its normal shape by unequal growth, some parts becoming disproportionately long or broad, curved to one side or fused together.